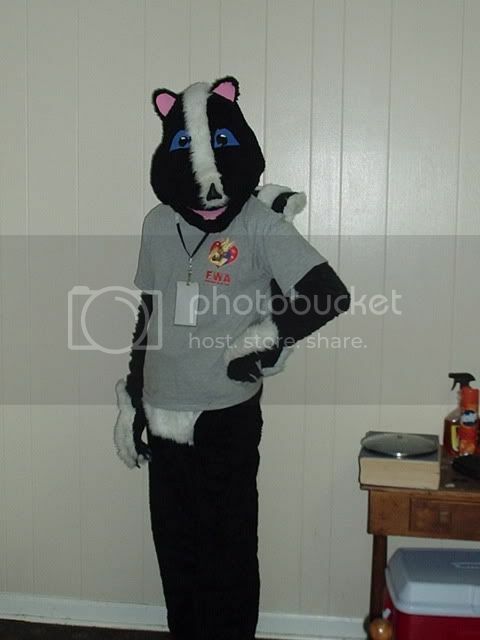 Furtopian Fursuit Parade - page 1 - fursuits, plushies, and costuming - Furtopia | Family Friendly Furry Forum and IRC Chat! 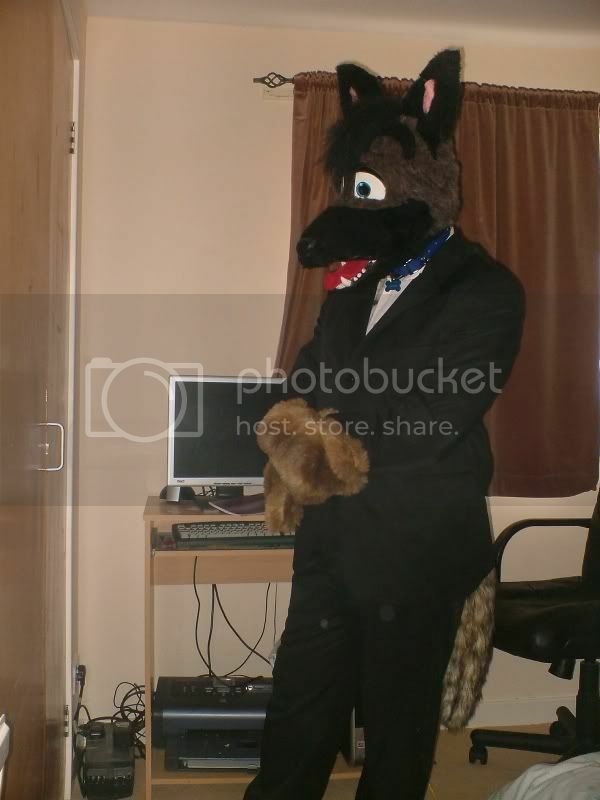 The only posts allowed are by those posting pictures of fursuits, be it ones they own, ones they have worn, or ones that they have made (While ads themselves are not permitted, pictures of fursuits that you have made or sold are allowed and encouraged). No comment posts are allowed, if you want to comment or ask questions please do so by PM. Why? Simple- the comments tend to overwhelm the picture posts in these type of threads and we wind up with 10 pages of comments to each page of pictures and no one bothers to look thru the beginning posts after a bit. Any comment posts will be deleted immedietely upon thier discovery and the poster reminded of the policy. All pics must be no larger than 500 X 400- this is to prevent the forcing of those on lower resolutions to side scroll and to keep the loading times some what tolerable for dail-up users. We want everyfur to both post and enjoy looking at the pictures. While there is no limit to how many pictures you may post please do keep from over posting pics of the same fursuit over and over (New fursuits do not count, you may post as many new threads as you have new fursuits! ). If you have new and more exciting pictures of your older suit then simply edit your older threads and replace the pictures within them. Again, this is to keep the thread usable and enjoyable for all. Now, to start things off I'm taking pics made in an older Furtopian thread we had long ago and editing them into the first couple of posts. These have been resized and are in the order they were originally posted. Okay. Though I think that most of you here have probably seen the Drabbit by now. Here it is. There are lots more pics of it on my website, of course. Right now it's just a partial with a trench coat. One of these days I'll actually finish the thing. But of course. How could I pass this up. 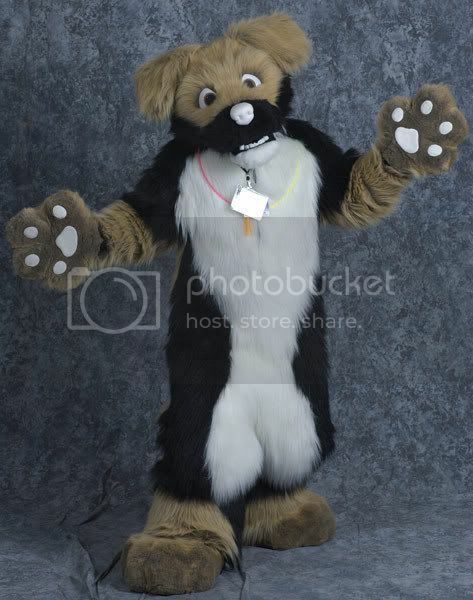 I'm sure everyone and their brother has seen this picture by now... My Ulario fursuit. 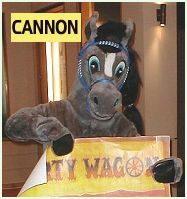 Cannon is my current 'party pony' suit. He is an accessorized Marylens suit. ToyFox is the suit I created for my wedding and was seen at several cons and videos. He was intended to be a 'plush fox' come to life with plenty of foam padding for cuddliness. Blue Fox is the one I was best known as during cons of the 90s winning costume contests, performing in videos, and the star of an 'infamous' act in a common area of an early CF. I could appear in him for hours and hours as I could drink, eat and use the bathroom in it. 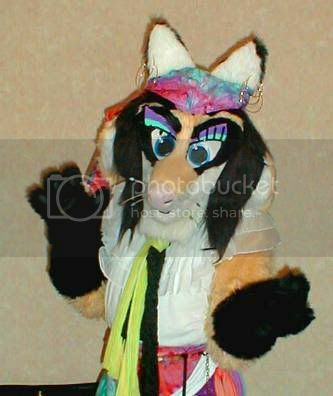 And my first, built by a friend, my red fox which I had several outfits for, my favorite being the ninja. He appeared at San Diego Comic Cons during the 1980s. He appeared at CF1. I own others by others makers, but right now these are my personal suits made by me. 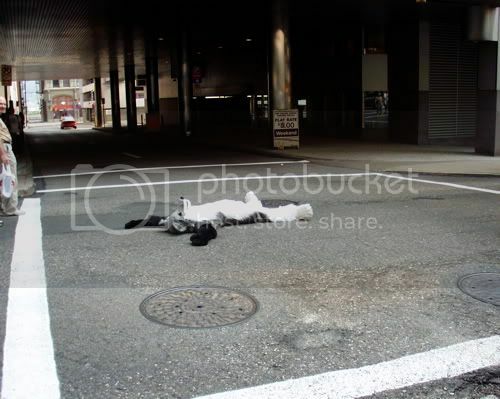 Taken at MFF 2003 with Dogz. 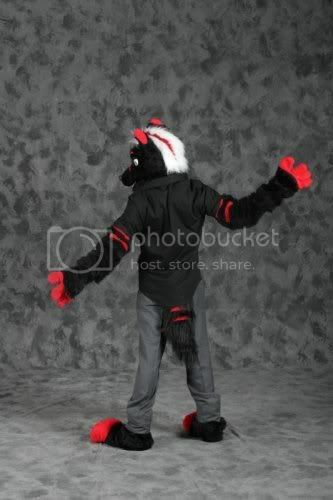 Finally, I have a picture of my HockeyRaven suit! It's, I guess, what you'd call a partial. I wear my head, arm/wings, and feet with normal clothing and black gloves. Unfortunately, my tail is not visible in the picture. This is sort of a dog, I think. This pic was taken at Glen Echo Parks Family Day- the Park Service has the fursuiters come and entertain the kids for the yearly opening of thier restored carousel. This was simply the most fun I've ever had in fursuit. We'll be returning there on July 1st to work the crowds with our fursuits again and I can't wait. Here are my personal suits, Joecifur (a bobcat) and Sora (a lion cub). Both are made by me. Here are my suits so far. I'll replace these pictures with ones of me in them come AC or so. Click the character names for more gallery pics. **Note** These pics look big, but the file sizes are tiny. First, 'cause I conveniently have the URL is Konjimaru, The Lucky Dragon. When his name is spelled with the proper Kanji, his name can be translated as a male name meaning "Made from dark blue fabric". Next is Random Kangaroo. He's a 1980's hip-hop B-boy type that's currently getting a complete overhaul. Rouge The Bat is next. I do anime cosplay as well, so sometimes I'll do non-original characters. Rouge is a jewel theif from the Sonic the Hedgehog series. And my latest one,Lucario, the legendary Pokemon. That's him on the left. That cute pouched fellow on the right is one of my pals, Frazzy 626. I don't have any good ones of Lucario by itself, yet. There's a 5th fursuit, but it's an extremely craptacular gryphon named Tiki that shan't be seen again. Notably, all the bird bits were made with real feathers. 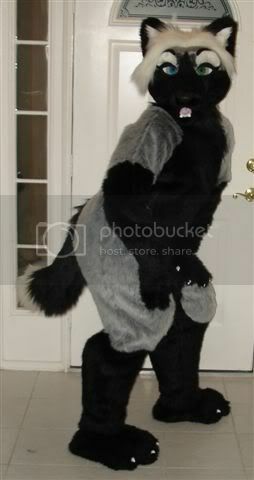 That's me in my Niiku fursuit partial. Made by me! The rules in this thread specify that all photos must be within 500 x 400 in size! This thread is under it's own rule due to the sheer number of photos in it- if furs cannot follow that rule then I will have no choice but delete this thread as it was becoming unusable for many members. Due to complaints I have spent 45 minutes resizing pics to fit withing that size rule- any further pics violating that size limit will be deleted without warning or notice. The oversizing of the pics was causing this thread to take over 10 minutes -Yes, 10 minutes- to open for dail-up users. If you cannot resize them yourself then send them to me and I will resize them and send them back to you too post-Do not post them first! Here I am resting at NAN DESU KAN.
And here I am getting attacked moments later! And me be friending one of the coolest dragons there. Just a reminder to new comers, DO NOT POST COMMENTS IN THIS THREAD, it is only for the posting of pictures of fursuits. * Colors/Markings: Copper, Russet, Black, White, Silver, Grey, Red, Orange, Brown in spotches, hatching, sponging, spraying, and painted pattern. White diamond on chest and back. * Likes: Handsome toms and fetching gents, louging whereever she pleases, drinking and stealing food from others, and playing with her catnip mouse. * Dislikes: Pollicles! (AKA Dogs) , Water , Jellicle Queens, and loud noises. * Other Notes: The suit is a full lycra/nylon body suit hand painted over the course of two months, the warmers and tail hand knitted and very fluffy! The make-up is also done by me each time I ware the suit, it takes at least 45 mins to apply. Toony or realistic: Meh, sorta in the middle. Clothing/Accessories: Black suit, red tie, white undershirt. Cons attended: Megacon 2007, Megaplex 2007. Likes: Messing with people, messing with everything, having fun, playing video games. Oh, and caffeine. Dislikes: Rude con staff (I'm looking at you, Jacon. ), annoying furries. Other Notes: Unlike almost all other fursuiters I've met, I actually talk when in my fursuit. PLEASE HELP, I AM HOMELESS AND MY CAT IS HUGE. I love whoever knows the quote. Mod note: If anyone notices any broken links to pics in this thread, please contact me immediately so that they may be corrected if possible. I also ask that any pics belonging to other people be checked on your personal websites/galleries and make sure you used the correct linkage, etc. Thanks. * Toony or realistic: 100% toony. * Colors/Markings: Brown, black and white fur on body, head and tail. Brown paws with white paw pads. White nose. Brown eyes. * Cons planned: AC, MFF yearly, Others will Rotate. * Other Notes: Gimme Treats! When all the milk has tuned and the toast has burned and kaptain krunch is waving fairwell. When the big one finds you, may this song remind you that they don't serve breakfast in hell. * Colors/Markings: Gray and black two tone fur with white fur in areas. Blue eyes. * Clothing/Accessories: Collar, and harness. * Cons planned: FC, and AC in 2008. * Other Notes: None I can think of. A few more pic's here. FCH = Furry/Canidae/Husky. We huskies deserve our own letter! WOOF WOOF! * Toony or realistic: toony. * Cons planned: MFM, oklacon, FWA. * Colors/Markings: Black, Grey, and White with a rusty patch on muzzle. * Clothing/Accessories: I change it up all the time. 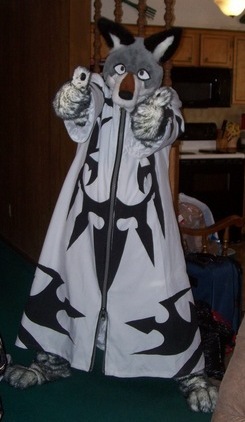 Shown in this picture, though, is a crazy looking coat from Kingdom Hearts 2. * Cons attended: None, yet. * Other Notes: The paws in the picture are not actually the ones built for the O.B. suit. 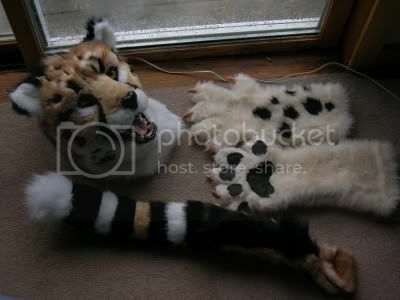 They are actually the first part of my fullsuit from Joecifur, to be completed sometime in the next few months.